Spring is here! The snowdrops have faded but daffodils are on road verges, roundabout and in woodlands, with celandine. Hedgerows are just tipped with green and every day I see the sticky buds on the chestnut tree across the road getting fatter, about to burst. So in Sunshine last Sunday we went to look for a maze. 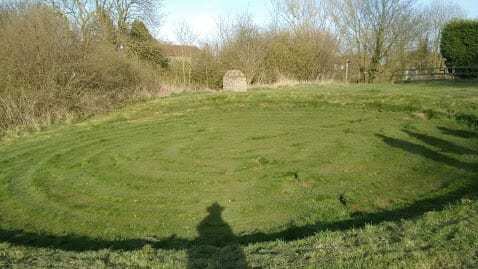 Julian’s Bower is a turf maze and it needs recutting. It is on an escarpment above the Humber estuary flowing west where the Trent River branches south towards Nottingham and Robin Hood country. Near here the Romans forded the estuary to march north to York. Legend has it that this maze was cut by the Romans, and that the maze came from the East, from Crete where only Ariadne’s thread enabled Theseus, the son of the King of Athens, to return safely after slaying the Minotaur at the heart of the labyrinth. In the Middle Ages they were sometimes known as Troys. Aeneas, a Trojan warrior who is one of the heroes in Homer’s Iliad, is said to have brought the idea of a turf maze to Italy after Troy was destroyed by the Greeks. Julian’s Bower is near site of what may have been a Roman fortress overlooking the route to York. Roman coins and pottery have been found in the area. It is also where monks lived until the 13th century. A 19th-century copy of the maze is in the nearby church at Alkborough, established mid 11th century and probably connected with the cell of monks. Why is it called Julian’s maze from at least the 1600s? It might refer to the monks who cut it were known for helping travellers, like St. Julian who helped travellers. He killed his parents by accident. One night a leper knocked on his door. As there was no spare bed, he offered his own, and the traveller turned into an angel. So St. Julian founded a hostelry in penitence. Whatever, I’m intrigued by the word ‘maze’ which rhymes with gaze, haze, graze (with its double meaning) and definitely does not come from the Norman French and Latin romance language current in English. Now that’s a thread to follow and I wonder where it will lead.